The Kerala Backwaters as they are famously known are coconut palm tree lined emerald waterways of interwoven lagoons, lakes, rivers and canals which National Geographic called as the “Green Venice of the East” and Kerala brands as “God’s Own Country”! These waterways weave together the very heartland of this land of spices where the world once sailed to, lead by famous world explorers and traders like Vasco DaGama and many more. 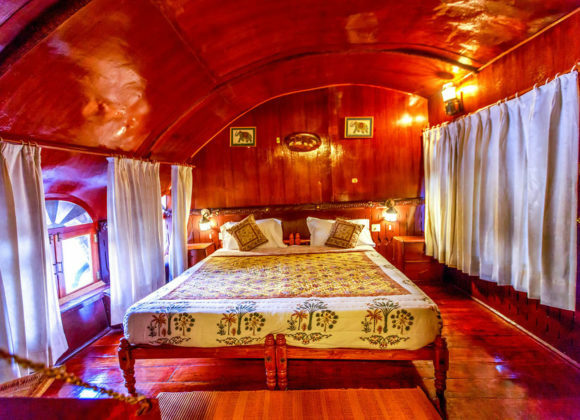 The river cruise takes you through wide lakes, flowing rivers, narrow canals and tranquil lakes with many villages on its banks that are only connected by water. Life is all on these waterways with people commuting in wooden dugout canoes where school children, traders and fishermen all mingle together to make the voyage through the bustling waters both colourful and very exciting. 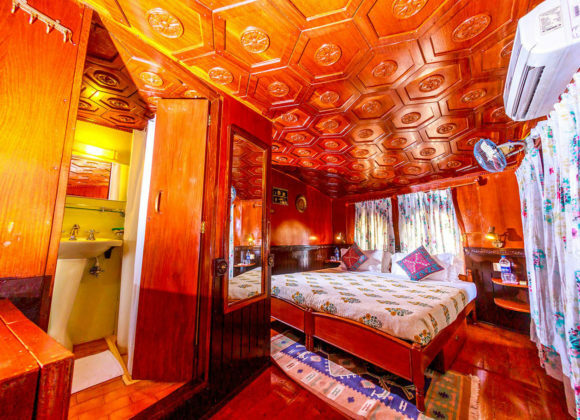 Visit temples, market places, experience traditional wooden boats are built by stitching the planks of wood together with coir rope. 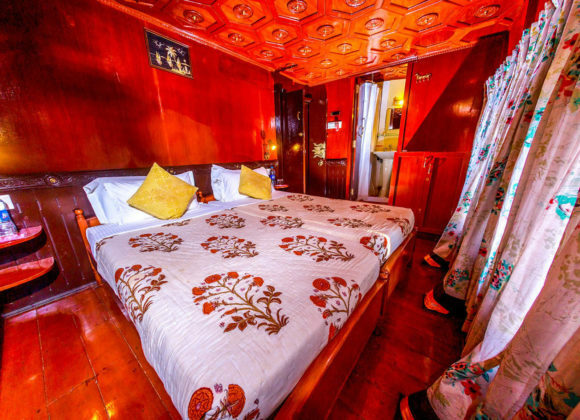 A really delightful tropical river cruise on warm waters with a lot of sun bathing and lazing as you sail towering twenty feet above the paddy fields in canals held together by dykes or, along the Arabian Sea where the setting sun splashes the endless waters with a bright orange glow. Arrive at Punnamada in Alleppey to embark on the river cruise boat after a visit to the local bazaar. This lake is the venue of the annual spectacular race of Snake boats on 2nd Saturday of the month of August by different villages of Alleppey and its neighboring places. The team on-board welcomes you on the boat and helps you with smooth check-in. Gather-together in the lounge for a safety briefing about the boat and about the cruise. We set sail, unwinding as the boat leaves behind the bustling township and cruises gently to the villages interspersed along the tranquil emerald green waterways of rivers, lakes, lagoons and coastal estuaries, expanses of paddy fields, swaying tall coconut trees, banana plantations and variety of tropical fruit bearing trees. Enjoy the traditional lunch and relax on-board. 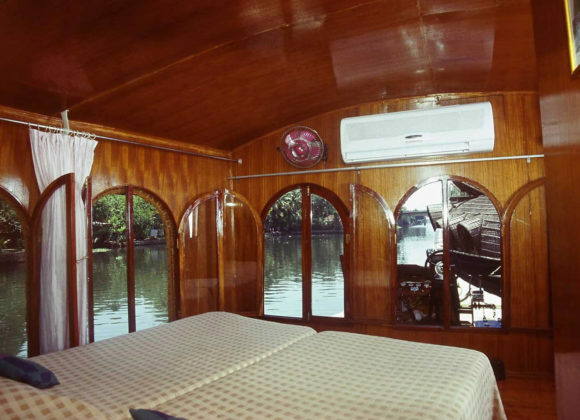 We talk about Alleppey – the Green Venice of the East, its geographical, cultural and social significance. We visit the village Kanjippadom for a leisurely walk. We meet the carpenters at the boat building yard and talk about the traditional method of building wooden boats (Kettuvallom), joining wooden planks using coir, cotton and natural resin. Return to the boat and cruise till dusk. After dinner we retire for the night. Today after breakfast we sail to a quaint village Karumadi. We take a walk around a small shrine preserving the ruin of a sculpture of Buddha that belongs to the early centuries of current era. We cruise to the coastal village, Thottappalli, passing by the spillway that prevents the saline seawater from flooding the low-lying paddy fields. We talk about indigenous practices of paddy cultivation in Kuttanad. We cruise to the interiors watching the indigenous practice cultivation of paddy on land below Sea level. Along the way we interact with toddy tappers, who are in to the occupation of collecting the sap of coconut palm to make the local alcoholic beverage –Toddy. Honoring your cruise with us, we plant sapling of coconut. Coconut tree is considered as the ‘Kalpavriksha ‘or the Divine tree of Kerala. All parts of coconut tree are useful in one way or the other: the water inside is a healthy drink; the fresh kernel and the oil extract from dried kernel are inevitable components of every cuisine; fiber from the coconut husk is used to make coir, mats and geotextile; the palm fronds are used for thatching roof; the wood suitable for making furniture and all the dried parts of coconut make good firewood. Last but not the least, the toddy – the boost for the laborers toiling in the fields. We take a short walk to the beach to enjoy the sunset. Return to boat and relax. After dinner, retire for the night. Cruise further interior of Thottappalli. After breakfast return to Thottappalli and check-out. Drive to Harippad to visit an ancient sacred grove near Harippad where serpents are worshipped. This is the only temple in Kerala having female priests. You can take walk inside and see the rituals going on. Depart after this temple visit. Taxes: 5% Government Tax. Or any other tax levied in the future. Insurance: Any travel insurance or personal insurance. * Prices are valid until May 2020. All bookings are subject to availability and terms and condition. As the first operation on this itinerary will be undertaken in end Sep 2019. The itinerary might need to be amended with minor modification post the first launch, exploratory cruise departure.